The popular Superflash is now even more visible with a brighter LED and an eye catching Turbo flash pattern. I have one. I use it as a backup to my seatpost tail light mounted on my seat bag, but the only thing it's good for is the Zitzzer pattern grabbing people's attention at night. ALL of the newer lights, especially those with Day-Flash patterns are far, far better light that will keep you safe night and day and have low-power modes for pacelines. I use eneloop NiMh batteries in mine and unlike LION cell lights whose protection circuits will shut them off then the battery is close to empty, this light will keep getting dimmer and dimmer, BUT, it won't shut off entirely for a very long time. That's a great feature for a backup light. I haven't thrown mine out, but I sure wouldn't use it for my primary tail light, I and wouldn't buy another, because there are even better NiMh lights out there now. I ride the roads of So. California, especially Pacific Coast Highway and out here you take your life in your hands with the way people drive cars! I don't ride at night but I do need a very bright tail light for my weekend morning rides especially along the Coast Highway where cars are flying by you at 60 mph. I haven't seen another cyclist with a brighter tail light than my Superflah Turbo and drivers seem to pay more attention when they come up on my tail. The light's easy to install in a few minutes and it hasn't come loose or fallen off and I like that I can easily unclip it when I clean my bike after a ride. Also the battery life seems outstanding and they're inexpensive to replace. I've run through water puddles and that doesn't seem to affect the light. The only gripe I have is that the mount is a bit flimsy and would be nicer if it was billet aluminum instead of plastic and I wish the light housing was black instead of white. 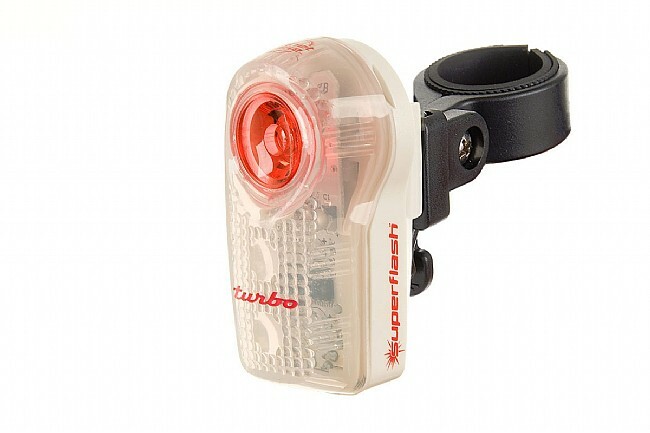 Overall, the Superflash Turbo is an excellent tail light, a fantastic value and a must have for safety. I purchased 2 of the turbos and they are very bright but on both of them when I got into light rain, they randomly quit working andor wouldn't flash but stay on steady. I called Planet bike and they sent me new ones but the same thing happened yesterday to the 2 new ones. I carried the extra one in case they quit and they both quit when I needed them the most. Planet bike said they have been tested extensively when wet but I was not even in heavy rain- more of a mist. I'm going to try electric taping the bottom where the onoff button is to keep moisture off the on-0ff button but I shouldn't have to. I use this light as my day light on the back of my bike. The light ls bright enough to still be bright in full sunlight. I usually keep it in flashing mode during all of my day rides, and I have been told by other cyclists and drivers that it is very visible. It is thrifty on its 2-AAA batteries, I can ride for several days, maybe 400 miles, on a set of batteries. I use the light at night in the solid mode, but only if I am riding alone. With others, this light is too bright for following riders (but not for cars). At night I use a pair of regular Planet bike lights on my seat stays, they are mounted lower and aren't in other riders' eyes. I have a Planet Bike Super flash on my bike and bought the Super Flash Turbo so I would have a back up but the Turbo is now the only one on the bike. It is a extremely bright flash and tremendous visibility in bright day light. I feel very safe running this new tail light. This is way better than any other light I have had. Very bright and can be seen from far away. Love it! Bright enough that I'm glad I'm not following me. I was surprised about how bright this was. Only used it for a few days so I don't know about the battery life, but it sure gets attention. brightest and most visible rear light i have found. easy to mount/remove from bike and makes you easy to see - even in daylight! easy to use, bright, annoying light pattern. The light pattern definitely keeps drivers alert to your presence. Easy to attach. This tail light is sooo bright that my friend hates to ride behind me. Way brighter than the Blinky and the onoff button works a lot better. I had the Blinky before and I think this light is a lot better and easier to use. I think it's worth the extra money and I recommend it. The Superflash is great. The Superflash Turbo is even greater! These are automobile level visibility. Only one complaint - they changed the onoff switch design on the Turbo. The switch on the Superflash is hard to operate - but the one on the Turbo is too easy, and could allow water in, I think. I like the Superflash switch better, I think. Pretty minor complaint, eh? This light is very bright and one can see it from a long distance. Planet bikes support bike advocacy. This light is visible and noticeable enough (due to flash brightness and pattern) to improve daytime riding as well as nighttime. I'm one of a minority (growing!) of riders experimenting (successfully!) using lights in the daytime to provide a bit of additional defense against distracted motorists. As an aside, anecdotally, I can report that motorists provide me with more passing room when I'm using daytime lights like this one, compared to no lights. Previously used a PlanetBike 5 LED tail light. I decided to try this light to make myself more visible for early morning rides. I get remarks for whomever is behind me that it's very bright and annoying. Is visible from a much further distance than the previous light. The flash pattern is very effective! I saw the specs on the Superflash and wanted to replace the other Planet Bike flash I lost on a ride one day. I have to lash the strob with a plastic tie on my saddle bag because the seat post and chain stay designs on my Trek Madone 5.5 don't conform to the anchoring system's circular tube expectation. Anyway, maybe that could be an option for some bike frames. I did do a better job of securing the new light with an extra plastic tie. I use it daytime, foggy, cloudy, rainy or sunny. Nice features and bright, bright! Thanks for a very affordable and powerful light! This light is visible even in day light. At night the regular Planet Bike superflash works fine but it is not bright enough during daylight hours to stand out. The Turbo is visible in the day time and provides just a little bit extra visibility to me so drivers become aware that I am there on the road. It seems to provide me with an invisible force field as motor vehicles seem to give me just a little bit more room when the Turbo is flashing. I am not sure I would use the Turbo at night because I do not want to blind drivers, I just want them to be aware that I am there. 36 of 38 customers found this review helpful. I recently lost my tail light and when looking at dozens of others at a recent bike event, I saw that the Planet Bike Superflash was the brightest tail light of all. I bought one and really liked, so I was going to buy a second one when I saw the Turbo model was available. I decided to buy that one. I compared these two models side-by-side at 100 yards at night. The Turbo appeared a little brighter at that distance. The major difference was that the Turbo appeared considerably brighter off axis than the standard Superflash. The difference is extremely pronounced, so I would recommend you buy the Turbo for that reason alone. When I have time, I will compare the two at far greater distances and I expect that the greater on-axis brightness of the Turbo will become more apparent.